Discovered by workmen in 1868 at Cro-Magnon, in the village of Les Eyzies in France. The estimated age of the site is 30,000 years. The site yielded 5 skeletons (3 adult males, an adult female, and a child) which had been buried there, along with stone tools, carved reindeer antlers, ivory pendants, and shells. The Cro-Magnons lived in Europe between 35,000 and 10,000 years ago. They are virtually identical to modern man, being tall and muscular and slightly more robust on average than most modern humans. They were skilled hunters, toolmakers and artists famous for the cave art at places such as Lascaux, Chauvet, and Altamira. The term 'Cro-Magnon' has no formal taxonomic status, since it refers neither to a species or subspecies nor to an archaeological phase or culture. The name is not commonly encountered in modern professional literature in English, since authors prefer to talk more generally of anatomically modern humans. They thus avoid a certain ambiguity in the label 'Cro-Magnon', which is sometimes used to refer to all early moderns in Europe (as opposed to the preceding Neanderthals), and sometimes to refer to a specific human group that can be distinguished from other Upper Paleolithic humans in the region. Nevertheless, the term 'Cro-Magnon' is still very commonly used in popular texts because it makes an obvious distinction with the Neanderthals, and also refers directly to people rather than to the complicated succession of archaeological phases that make up the Upper Paleolithic. This evident practical value has prevented archaeologists and human paleontologists - especially in continental Europe - from dispensing entirely with the idea of Cro-Magnons. 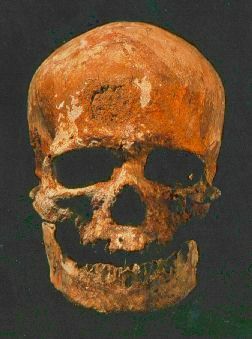 Cro-Magnon Man - One of the earliest and best established fossils is at least equal in physique and brain capacity to modern man... so what's the difference? D'oh! To the best of my knowledge, no one has ever claimed there was a difference. My thanks to Doug Weller for finding the quote from Oxford Companion to Archaeology and posting it on the talk.origins newsgroup.